We have been to the National Science Center several times now and the kids never get bored. Each visit seems to last longer and longer (today was 6 hours!). There is just unlimited things to explore and do all for about $2 (little kids free). This place is never packed, except on school holidays, so we pretty much have the fun of the place. Once we bought our tickets we passed the fish touch pool and walked through the aquarium tunnel with large fresh water fish. This leads to the elements display of air, water and light. The next area is the Pathways to Science displays. Chemistry, biology, solar system and physics interactive activities for kids. Once we walked out of the Pathway to Science area the museum opens up to several kids play area for all ages. An over sized jungle gym, a foam ball shooting cage and a little kids play area. Several other areas branch off from here. 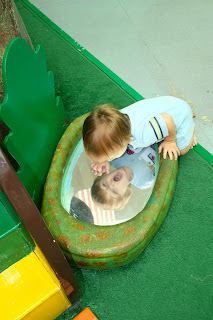 Our kids loved the Kids World with interactive music displays, a tube ball wall, mirror maze, tractors and more. The nearby Kids Discovery place is geared for kids 4 and under. We got to pet tiny baby bunnies here. And finally the Eureka area has puzzle and skill type activities. Now if that isn't enough, they have an upstairs that is sometimes open and sometimes not. Mostly it is open on the weekend with an aviation section and special events area. Once you are finished with the museum inside there is a whole discovery park outside. A kids play area! Parents walk down the path to the bottom. Kids get to take the fun way down the hill. Once at the bottom of the small hill we reached the water park. It's quite big with lots of spraying guns, things to swim under and a tire rope walk. Refreshing fun to beat the hot KL sun. Interactive play equipment (for adults too!). Swings, spinners and exercise equipment would have kept us all busy but it was hot out so we stuck to the water park. At the top of the hill is the Butterfly Garden with loads of beautiful butterflies, fish pond, bunnies, lizards, frogs, scorpions and more. We saw so many beautiful butterflies. The garden is enclosed with misters and covered to keep it cooler. The kids have been here several times and keep asking to go back. We usually stay for 5 hours. After that I'm done! It's hard to believe we get to do all these cool things for only 6RM ($2US). Little kids are free or we've never been charged. Plus, during school holidays everyone is free. I'm glad we are living so close. Best way to get here is taxi or bus. I think this is my new favorite museum. TIP: Bring your own food. Food here is not that great and limited.